More than sure you have read over and over that Pinterest is a major source of traffic for most bloggers. And indeed Pinterest is a unique combination of search engine and social platform that’s gaining importance each day through gradual market infiltration in valuable demographics. As you have probably found out by now, Pinterest made some major changes in their algorithm this summer and consequently, we have to update our Pinterest best practices for business from now on and in 2019. These changes hurt traffic generation for lots of us and we have to tweak our incorporated Pinterest marketing strategy in order to profit on the opportunity to reach out to our audience till this is still free. There are many Pinterest marketing strategies out there you can use to gain more visibility from Pinterest, but some bring results some not, it depends on many details. You just have to try and test and keep what works best for you. Folks at Pinterest decided to become more transparent and started this year to make public their intentions on how the platform will evolve and what content creators (meaning give you, me and bloggers in general) should expect. So, let’s cut it short and see what you can do to improve your Pinterest marketing in 2019 and your strategies for more traction! Obviously, the algorithms are always on the move and you have to move with them. We have seen Google, Facebook and now Pinterest updating their algorithms, and this will be a constant in the future. Being ready to learn new ways of doing things is not an exception otherwise you’ll be left out. Pinterest, like any other social platform, involves numerous changes that happen permanently. The way the platform worked in 2018 will be different from how it will work in 2019. With the development of technology, there are new requirements that come with it for the betterment of the platform at large. When you adapt to the change, you’ll know how to use Pinterest at any time or season. Thus, be flexible and embrace change! This is the true path of evolution. What we’ll discuss forward is part of the changes that already took place on Pinterest and impacted current Pinterest marketing strategies. Most of them are Pinterest creative best practices that have yielded results to those that have tested them, me and my clients included. Pinterest Marketing Tip: The only constant is change, get used to it and embrace it. For all details on Pinterest updates from this summer, check Alisa Meredith’s of Tailwind interview with Pinterest’s Product Marketing Manager Sarah Hoople Shere. The new facelift of Pinterest profile includes a Cover banner. Here you have several displaying options like your latest pins or pins of a certain board. I suggest that you insert here the board that contains just your pins. In my case “MarketingDigiBook” board. Another new tab is the Overview tab that offers a glimpse of the recently saved pins, pins saved from your domain, and the most recent boards that you saved pins to. Supplementary additions are the Follower tab – it shows the number of your followers, the Board tab – lists your boards in various ways and Monthly views – displays the average number of persons that sees your content in a month. Pinterest Marketing Tip: Take advantage of the new profile functionalities and create a good-looking profile. This is the recently updated rule on Pinterest creative best practices 2018 and it is a game changer. We all have the possibility to choose between smart feed or following feed. The following feed lists in chronological order the newest and greatest pins of the persons that you follow. Which translates into increased importance for engagement and fresh content. he main purpose is to create more pins, based on delivering more content. New pins will be favoured by the new Pinterest algorithm. The idea is to focus on producing more pins and expand their reach to increase blog traffic, not necessarily to increase the number of followers. In addition, it is advisable that you create multiple pins for the same post. This advice has been added to Pinterest best practices 2019 page. Others can opt to create a different pin version which is still good. However, when you do this you should change the pin description. This is important as the platform will read it differently from your other pins. You are also in a better position to reach out to different audience using the selected keywords. Even if there is no such thing as ideal number of pins for a day, you should test to see what works best for you, play with the number of pins. Just be consistent, do not pin in bulk one day and nothing the next few days (use a scheduler to help with this). In the new following feed your followers will see all the pins that you saved in a row. Pinterest Marketing Tip: Pin consistently and throughout the day. To come up with the best Pinterest marketing strategy, you have to ensure that you follow the guidelines laid by Pinterest, that’s obvious. There are many myths flourishing on the web about the new pin ratios and the best images that work. Choose high quality photos and avoid human faces on your pins (or test this – depending on niche might be different results). Another thing is that these types of images need to have the ability to grasp the attention of the reader. In general lifestyle images are a good choice, persons need to visualize the item in context. Use overlay text to provide more context or a creative description, preferably both. Making someone stop whatever he/she was doing by an image isn’t a joke. The images should be of high-resolution and colorful. Do not forget to test your pins on mobile, as 80% of Pinterest users are on mobile. Pinterest Marketing Tip: You might consider making your own photos instead on buying them or using free stock. This is what has been causing a huge debate on Pinterest. Everyone is coming with his/her size that has worked for them causing confusion to new users. Actually, the only thing that has changed is the cutoff point but not the pin ratio. It is still the same as it used to be – 2:3. For those that are obsessed with square pins, they are back, and this is one of the recent updates. Recommended size by Pinterest is 600 by 900. Those are the measurements for the width and height respectively. The maximum dimension is 1260 long but as long as you keep the rule ratio. The larger dimensions that used to work until now, might not in the future, as they will get cut in the new feed. Pinterest Marketing Tip: For new pins use the recommended dimensions. For your best performing pins create new ones with these dimensions. Common for Twitter or Instagram fans, however, they are back again on Pinterest. What do they offer? A real time feed for users. Pinners that want to find out what is trending on Pinterest use hashtags. You should include them in your new pins, it’s not necessary to modify the older pins as this is irrelevant and place them at the end of the pin description. I use in general 5 hashtags for my pins. · Relevant for your content. · Act as a broad search term. This means that it should not be used for any other purposes like humor. · Add a maximum number of 20 hashtags once you have discovered that they are relevant for the content. Hashtagged pins get more distribution the day they are saved. Pinterest Marketing Tip: Add hashtags to your pin description, place them at the end of the description. At some point, we said that Pinterest loves fresh content and will give priority to it. Let us now dig in to get to know what this fresh content means. Fresh content means firstly an article that you just wrote and that you publish for the first time with its associated pin. New pin for article already published counts also. Before we go further, Pinterest loves new content as it is the main concept behind adding hashtags. The use of Hashtags has two main purposes. The first one as we all know is that it is used to identify a keyword and facilitate the search for it. The second function is that it is used to differentiate a fresh content from an older one. In short, they act as filters. According to studies performed on Pinterest metrics, pinners are more interested with new content and that’s why everyone rushes towards it. Your followers on the platform are always searching for content that will satisfy their needs. So, freshly posted pins are more on their radar. By constantly posting new content, you are able to swiftly draw a large number of readers to your profile. Also, be aware that a new Pinterest best practice is to save new pins directly from your site instead of repining it. For example, if you have a new article with a new pin and you want to save that pin to seven boards, save the pin directly from your site for each of the seven boards. Pinterest aims to promote the content creators or first pinners. So, pins created by the owner of the site and pinned from the respective site first will be given distribution priority in the feed. Another detail to take into consideration is to pin first to the board that is the most relevant to the topic of the article. 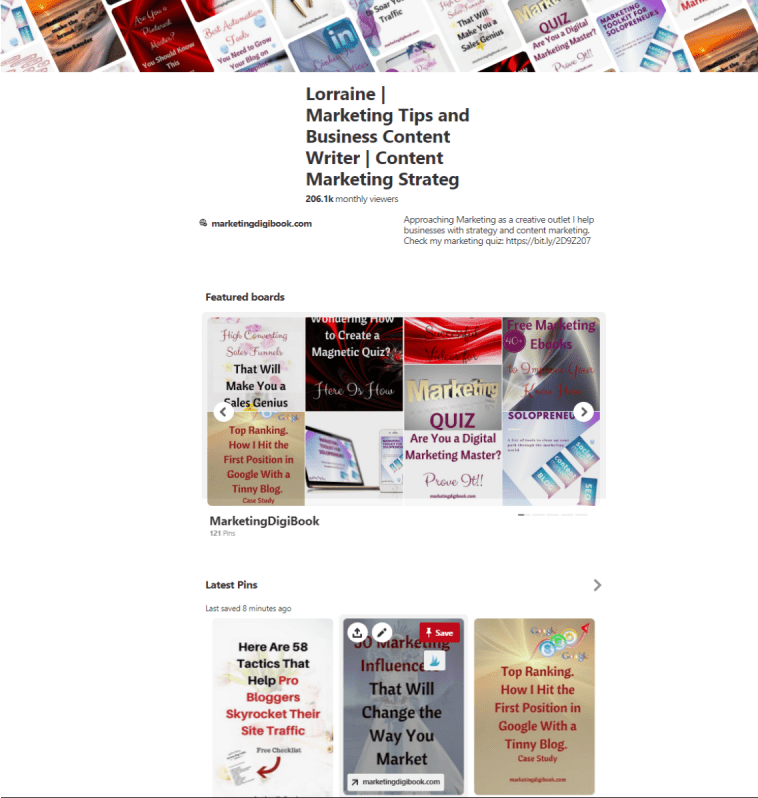 This article for instance will be first published to my boards in the following order: Pinterest tips and tricks, Social Media Marketing, Social Media Strategies, Digital Marketing, MarketingDigiBook. Pinterest Marketing Tip: Pinterest algorithm will give first priority to new pins and newly published content saved from your site. Pinterest Marketing Tip: Pin your new pin first to the most relevant of your boards upon its topic. If you have been keen on Pinterest users’ questions, you know that this is the most frequently asked question. Let’s get this straight. You can use automated pining as long as you use a Pinterest approved scheduler. It is advisable that you ONLY use schedulers agreed and approved by Pinterest. If you consider is best for you to use one, ensure that it is approved. Now next big question is: do you need to use just manual pinning, just automated pinning or both? Each option has its fans. Personally, I use both and I will explain you why. I tested pinning 100 pins a day with Tailwind and some manual pinning, I tested just automated pinning without manual pinning and I used just manual pinning when I started this blog. - You should keep manual pinning, daily if possible, at least 10 manual pins. If you renounce at manual pinning you will see your monthly views decrease heavily and also your traffic. Monthly views are not a very important number, but anyway to see this number decrease with about 50% (from 370 k to 200 k) in one month it’s not ideal. My traffic from Pinterest was affected less, but it still decreased. I also saw decreases in traffic and monthly views for other blogs that belong to my clients. Even if Pinterest says “You’re considered active when you’re saving content on the platform.” That is not exactly true, manual pinning counts. - Decreasing the number of scheduled pins might not affect the traffic that Pinterest delivers to your site. In my case it didn’t, I decreased from 100 pins a day to 80 pins and after that at 50 pins. Pinterest Marketing Tip: No matter your choice, do not skip on manual pinning for too long. A Pinterest Scheduler can be a huge time saver. Even if there are bloggers that say they have great results with manual pinning, the truth is manual pinning requires lots of time. Personally, I use Tailwind to schedule my pins in group boards and Tailwind tribes. I have to confess Tailwind helps me minimize the time I spend on pinning and brings nice results. I use it for this blog and for blogs belonging to my clients. Besides having a smart schedule that allows me to optimize the best time to schedule pins when my audience is most active, I am very pleased with their looping options that I employ to schedule my evergreen content into my boards. And also, with the analytics tools that I can use to measure the results of my Pinterest strategy. These are the options of the Insights tab: Profile Performance, Board Insights, Pin Inspector, Website Insights, Organic Activity, Referral Traffic. Pinterest Marketing Tip: Pins scheduled via Tailwind are posted as fresh pins not as repin. Pinterest Marketing Tip: Tailwind can offer you extra referral traffic via Tailwind tribes. Give them a try. Another question that pops-up frequently is if you as content creator need to pin content from others. Pinterest sustains that not, as long as you have enough content of your own to promote. To be tested. What about them? The first thought that comes to your mind is to delete them as they don’t add any value to your account. Not really. If you get the chance to speak to bloggers that have reaped big chunks of dollars in Pinterest, you’ll know that they are not into the idea of deleting the under-performing pins. You could think that they are probably hurting your performing pins, but they aren’t. The performance of a pin has no effects on the rest of your pins. As we all know (probably by now) Pinterest is subject to algorithmic change and new updates. This can turn out to be good in the long run. The under-performing pins may gain traction and become useful due to new changes and turn into a goldmine. What you have to do is to constantly review the Pinterest analytics and find out which are the pins that are performing well and those that are not. For the ones that aren’t working well, you can do some revamping or simply create new pins with another description to increase the engagement. From my own point of view, I strictly do not recommend deleting any of your pins regardless of their performance. Pinterest Marketing Tip: Do not delete underperforming pins, you don’t know when you’ll have a nice surprise. Make new pins and improve their description. Make sure your pin links to the article you intended. What you should keep in mind is that the pin is not about the image but about the content and relevance of the image to that content. The pin only acts as a short description of its content. To make the pins more effective, ensure that the keywords are matching. Keywords are the primary vector that drives eyeballs to your profile, boards, content and finally to your site. Hence use them properly. The huge majority of the reach will happen far beyond followers that’s why SEO counts. We hear all over “use catchy titles”, some people use puns and clever titles hence cannot be found when you type the keywords you’d like to search for. Remember Pinterest is a search engine. Board names are not a place to show your prowess in the English language. Pinterest best practices advise that you should ONLY name your boards with keywords. But do not exaggerate, do not stuff the board name or the description only with keywords. Make all your descriptions conversational. The keywords should just be enough to help the algorithm understand what it’s the pin or the board about. To make the keywords more effective, they should be written in a user-friendly way. NB: The Pinterest SEO keywords should be relevant to the boards. The relevance of the keyword helps in spreading the content which will, in turn, reach a larger target audience. Pinterest Marketing tip: Use keywords relevant for Pinterest not keywords that are relevant for Google. If you are a Facebook, Twitter and Instagram fanatic, you understand pretty well that followers are the drivers of your account. The more you have, the faster and wider your message will spread. The same case applies from now on to Pinterest. As the way to get your content show up in the Smartfeed pass first through your followers. Even if it’s still possible to generate high traffic for your blog without having a large number of followers, they have a heavy word on spreading your new pins. With the recent updates, the followers are the first to have a glimpse and interact with your new pins in their feeds. The best thing for business is that Pinterest has a high affinity for new content. Pinterest will, therefore, ensure that the content reaches your followers as fast as possible. If your followers are relevant and show interest in your content, they will quickly engage with it and roll it over to non-followers and Pinterest will push it further into the topics and feeds. And this is how pins become viral. However, to make this happen, the ball still rolls on your side. Any content you post on the platform must be relevant to your brand. Nobody likes irrelevant and random boards that make no sense. For example, picture this. If you are a home décor entrepreneur, everyone expects your posts to be full of the best home upholsteries, décor boards and decorative brands. You don’t need to post irrelevant posts like food recipes or fashion related boards. A final tip: unengaged followers are not of much use. If most of the many followers are not active, they will not spread your content. It is better that you only have a handful of followers that engage with your content rather than a million of them that will not even take a look at what you’ve posted. Pinterest Marketing Tip: Aim for engaged followers that are interested in what you have to say, not just followers. The latest big thing in Pinterest marketing are the communities. Indeed, Pinterest stated in summer that they will no longer privilege group boards to pop up in searches and I suspect we got our answer on “why”. Communities will be replacing the actual group boards and strive to be an improved version. Pinterest Communities come to add more social flavor and prove that Pinterest is a social network also. Communities are the new way that pinners can use for communication, for promoting their business to new audiences, for posting links and comments. Communities are just starting and are in the early stages, so you are fee to create your own with the name of your choice if it is not yet taken. With all said and done, it’s now the time to put all that you’ve read into practice. The implementation stage is more important than any other step and this is where many bloggers fail. It is of no use that you get all the available helpful information and throw it away. 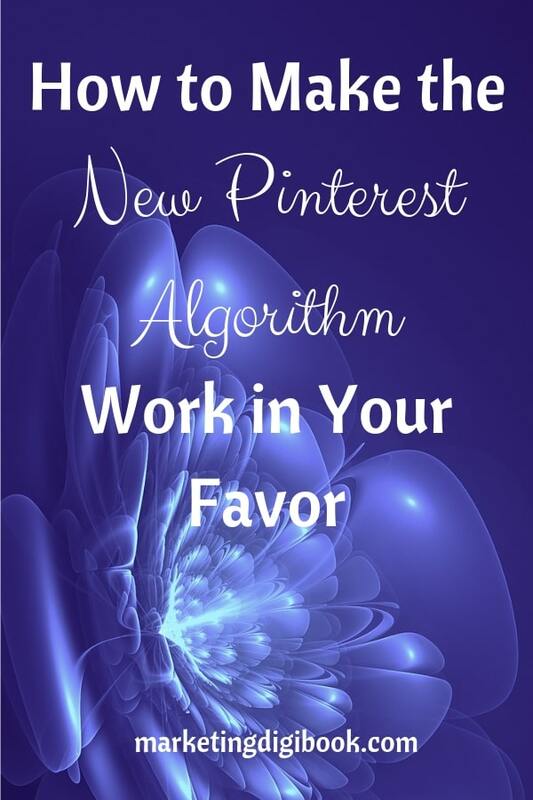 There is lots going on with Pinterest algorithm and probably even lots to come. And consequently, lots of changes to implement and the above-mentioned Pinterest best practices for business should be of help in 2019 to keep attracting quality traffic for your blog. You might find hard to apply them all. Take them one at a time and see what you can incorporate successfully into your Pinterest marketing strategy and what brings you results.